Boo hoo! No TTT for me tonight. If you read my post last week, you'll know I've been terribly excited about seeing The Two Towers in the new high-definition prints that are being shown around the country tonight. After the beautiful visual and aural detail that popped out at me watching the newly remastered FOTR last week, I was really, really, really keen to see this version of TTT -- in spite of the EE having some of my most hated moments in the film trilogy. (I had planned to deal with that by taking my bathroom break just before the worst of ithem came on.) But a big swath of bad weather has enveloped this part of the upper Midwest. Thunderstorms and heavy rains are holding sway over Minnesota today, tonight, and tomorrow. Traffic advisories are flying off the weather sites like Stukas. For you who live elsewhere and are going to see TTT tonight, have a WONDERFUL time. I'm so jelaous! i'm so sorry, dear. I guess we'll both have to be with the TTTr's in spirit! I know you're dreadfully disappointed. Darn that weather! I was watching the Weather Channel earlier and it seems like a third of the country is stormy right now. Thanks, Ladyhadhafang. Your handsome icon reminds me I'll miss the EE flashback featuring Boromir after the victory at Osgiliath. A darned good sequence, and another reason to say, "Whaaaaah!" So sorry, I know how you looked forward to it. I do hope the weather is good for ROTK next week. Oh, that's such a shame. :( Better luck next week! P.S. I LOVE your icon, Telstar. Is that Paddington Bear? I like TTT EE the best of the EE's. I think that's because I HATED the official cut; at least the EE made PJ's fanfic version make more sense. I adored the scenes with Boromir and Faramir especially. I'm sorry you couldn't go. I might attempt the final EE showing next week; my cold has subsided enough that I might chance it. Luck to us all! I love the extra Boromir material at the victory at Osgiliath, too. Very much. And I loved Faramir's dream-vision of Boromir in the boat. Still, overall I thought the EE of FotR was the most successful when it came to improving the theatrical versions. And nothing was added that I didn't appreciate. As for TTT, some scenes I love in the EE, some I hate. Same with RotK's EE: love or hate. But the bright side, if you had to miss one of the 3, good thing it's this one for the rain out, right? 1)Afternoon tea shadow. Well, not on Frolijah, but on the other 3 hobbits. Boy, you got back home lickety-split, hey? No, wait. You're in Eastern time. Well, Lavender, I guess ain't nuthin' perfect, from you're a'tellin' me. Still, I wish I'd seen it on the Big Screen. What's the afternoon tea shadow? And Frodo's smile at the end - which one? The one when he says, "I want to hear more about Sam", or the "so was I" smile? Or some other smile? I'm surprised because, at least in recollection, neither of those smiles seemed to be delivered while performing action, or hardly any. Aww, I'm sorry, Mechling. Just comfort yourself with the thought of all those heresies. :p (I still can barely stand to watch Osgiliath.) Having said that, the TTT EE is pretty damn good and soooo much better than the theatrical release. My favourite additional sequence is Boromir/Faramir in Osgiliath ... just wonderful. There's a lot I do actually like in TTT, as sequences in their own right. And Miranda's Eowyn is one of my favourite film characterisations. -- The opening scene in the Misty Mountains is incredible. One of the best openings to a film, EVER. -- Gandalf and Balrog falling like a flaming star is jaw-dropping. 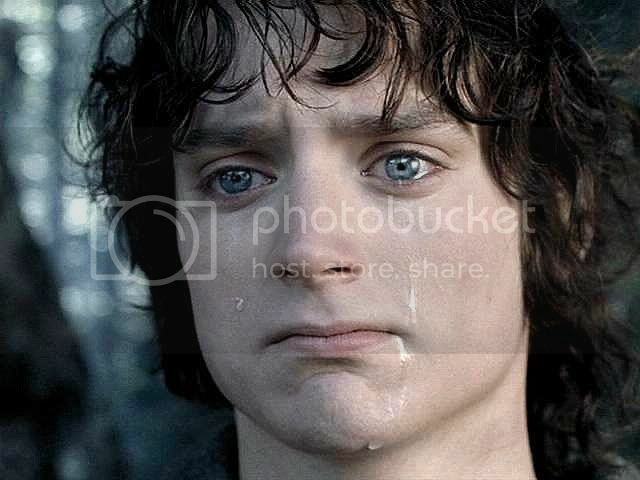 -- Arwen by Aragorn's tomb, A-M-A-Z-I-N-G. Made me gasp out loud first time I saw it, and my eyes filled with tears. I'm not even an A/A fan, but man that was PERFECT. Aragorn's fake death is STOOPID. :p Although I quite like his reunion with Legolas. ;) And Eowyn's reaction to it ... awwwwww, poor lady. I got up to the point where Sam is calling Smeagol Stinker and Frodo is like why do run him done all the time and I want to believe he can be saved and all that argument and then the power went out due your aforementioned bad weather - a quite brief but very intense storm with very heavy winds. I wasn't even aware it was happening, thinking it was just extra sound from the movie as this was just when Smeagol was leaping into that stream after some fish and I thought it was that I was hearing. Apparently there was a lot of lightening also but all I heard was the rain. We got passes for a free movie but not sure if it will be rescheduled or not. If it is, it will be tomorrow night. I really hope they will do it because I didn't even get to my two favorite scenes - Smeagol and Gollum's little tete a tete and Frodo drawing Sting on Sam and Sam just loving and loving without skipping a beat. I was really enjoying it too, much more than I did FOTR which is certainly different for me. I am all right but a lot of people are without power, including the office I work out of, a lot of trees and/or large branches down and a lot of lights still out. I'm sorry you missed it but glad you didn't risk it. Here's looking forward to ROTK next week! Gosh, what a story! Did you go to a theatre in or near Chicago? I'm thinking you must live in that area, since you are going to see the concert-to-film performance this summer at Ravinia. What a storm you had, worse than here! We are in our third day of rain and wind, but the extreme winds are dying down. I haven't heard about power outages or major trees down. I've seen a young street tree that was snapped off, a big branch down here and there, but mostly lots of smaller branches and a lot of leafy debris lyinin the yards and streets. But the cells of the larger storm were so localized, rain hitting the windows like people throwing buckets of water against it for a while, then just wind, then more lashings of rain, maybe there were areas that did have the sort of damage you're describing and I just don't know about it. I'm glad you are safe. The forecast is for mild weather this week, maybe some rain, but nothing tempestuous. Yay!